In Dekaron Rising there are currently four different types of wings you can use in the game. UPDATE: The Wings System has been changed again. To see the stat changes please follow this link and scroll down to Wings. 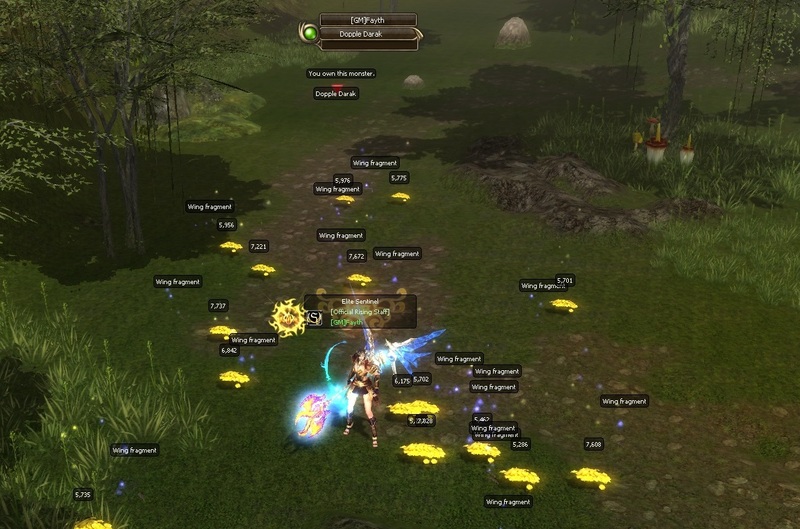 These are given to your character for free at experience level 1. Located in your Newbie Box, which also gives you some other free goods, are these wings. At level 70 you are able to use these wings and they look the same for ALL classes. If you discarded these wings you can still have them! Teleport to Parca Temple from Ardeca using the NPC Makaio. Press M on your keyboard and search for the NPC Hosea located close to the center of the map. Talking to him will show you level 70 wings. These wings have no expiration. Teleport to Egutt Desert from Ardeca using the NPC Jerome. NPC Hosea is close to where you spawn at, you can find him directly beside the teleport NPC. At this tier, every classes wings have a specific look. You can not wear Azure Knight wings if you are a Segnale! Finally, these wings have no expiration. These wings cannot be purchased with dil unlike the previous two types already discussed. 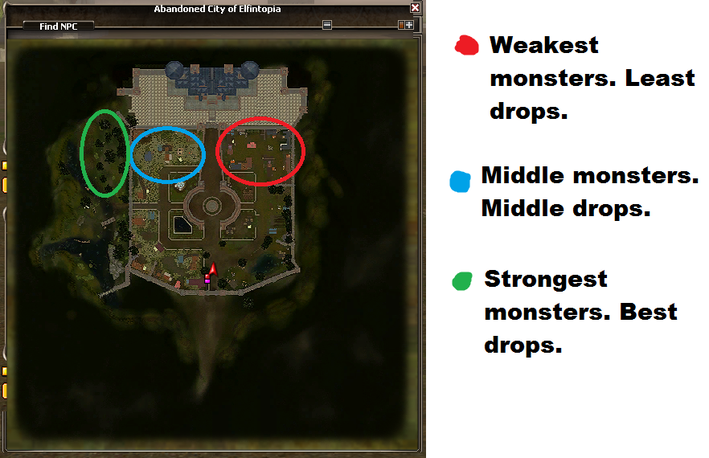 Mithril can be obtained from the map Deadlands. You can teleport there using the NPC Jerome located in Ardeca. and travel to the bottom left corner of the castle where you will find the NPC/Exchange Master Ishtar. Select the option that says "151+ Wings Exchange" and exchange the 300 Mithril towards the class you are using. Once again you cannot wear the wings of another class. At the date of the post you can purchase 300 Mithril for an average price of 8-10 mil from other players. These are currently the best wings in the game thus giving the best stats and highest speed bonus. To get these wings you can either purchase DSHOP from another player or purchase the DSHOP yourself here. corner of your HUD (Heads-Up Display) that resembles a "D". Most classes can wear all of the wings however some cannot so check before you buy from another player. These wings will expire after 365 Days has elapsed. In order to help adventurers fight against the Doppelgangers, Kunda has appeared. 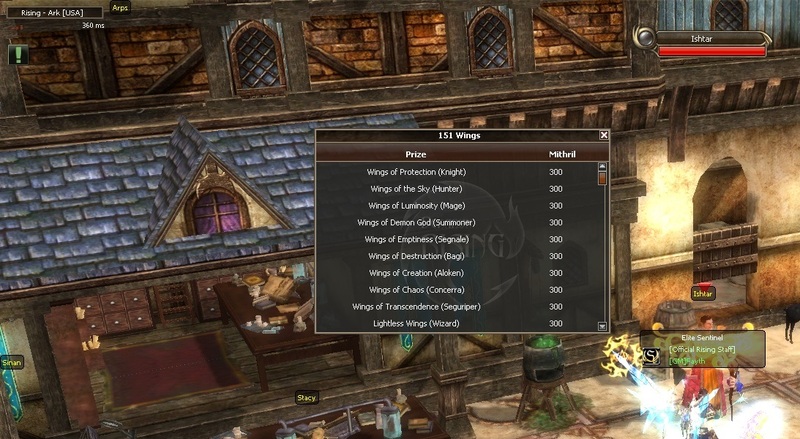 This merchant in the Abandoned City sells upgraded wings. Bring your 151 wings, and wing fragments looted from the Dopplegangers to Kunda, to receive your new wings. Wings upgrade from 151 to [Eo] wings for 100 fragments. From [Eo] Wings to [Xera] Wings for 200 fragments. And from [Xera] Wings to [Ys] Wings for 300 fragments. Wing Fragments can also now be obtained from the Ruins of Rudene Instance Dungeon! Just go in-game, move your cursor to the bottom right-hand corner of your HUD (Heads Up Display) and click on the D-Shop. There you can view every pair of wings and every costume that is available for your class. Donation or buy from another player as a gift to your character, ALWAYS USE A GM OR OPR AS A MIDDDLE MAN. Hi there guys, i need some help. i choose the wrong wings for my class? what can i do for i cant bend, and trade to a friend.. i was Dragon Knight and the wing i clicked was for the knight.. its my mistakes coz i didnt read the whole option..